The other day my son and I were running errands and after he helped me unload the car he asked if he could have a snack. I asked him what he wanted and he mentioned that when he was hanging-out at a friend’s house his mom made a snack that he really liked…apples with lemon and chili. I love learning about snacks that other cultures serve. I was really excited to try this! 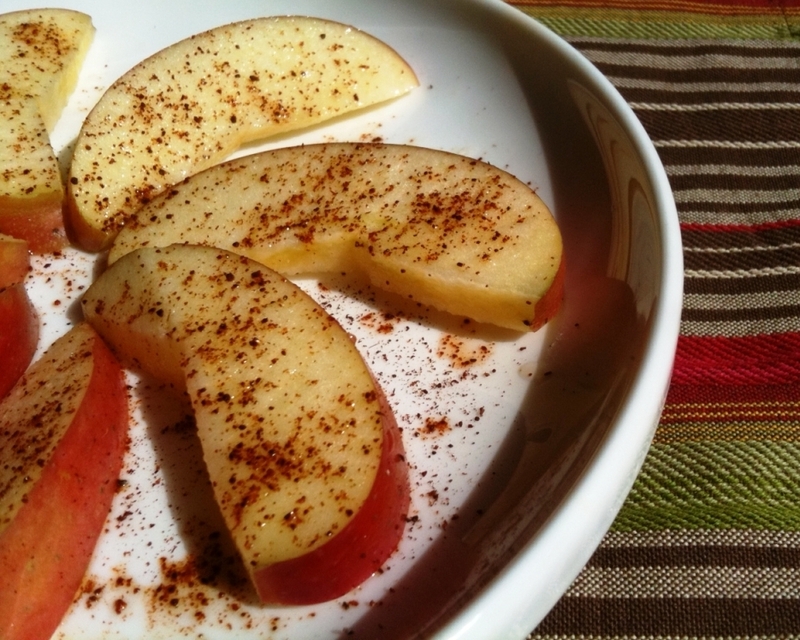 I sliced the apples, squeezed some Meyer lemon on top, and sprinkled them with chili powder (by Frontier). I really loved the combination of sweet from the apples, sour from the lemon, and spicy from the chili powder (my son LOVES spicy food just like both of his grandfathers). After we finished the plate we decided to try it again with Via Nueva’s Chili con Limon…brilliant! Let me know what some of your favorite ethnic quick snacks are…maybe they will even be featured on Veggie Grettie. That sounds great too! Come to think of it…I have eaten dried mango with chili…I bet fresh would be even better! It’s perfect on cucumbers too!